Chromecast 101 is a series of eBooks on how to setup, use and troubleshoot Chromecast, the most innovative gadget in 2013. This is the official page of Chromecast 101 eBooks published by AllAboutChromecast.com. 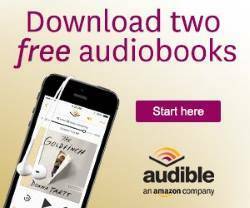 Some of these Chromecast guide books are given free through newsletter links. This small (27 pages in PDF including cover) Kindle eBook is the simplest Chromecast setup guide. It was written specially for absolutely-new Chromecast owners. Chromecast 101: the Unofficial Chromecast Setup Manual (ASIN: B00ICGDDY4)only solves one problem: setup your Chromecast. Nothing else. There are no advanced topics. page). We compiled it in Kindle format with some added info and added screenshot and photos. For advanced topics and Chromecast tips, please check our Chromecast how-to guide page. 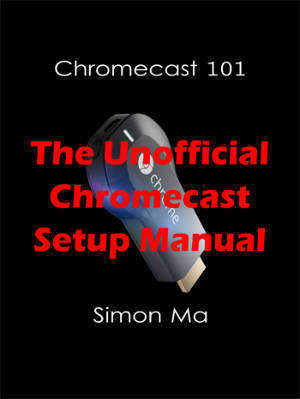 This Kindle eBook (Chromecast 101: The Unofficial Chromecast Setup Manual) is free on Amazon on the following dates: March 20-21 (2 days) Feb. 14-15 (2 days), Feb. 27 (1 day only). This is the second book in the series of Chromecast 101. In this book, I will show you how to stream your own media collections to the big screen with Chromecast. After reading the book, you should know the advantages and disadvantages of each of the 6 methods for streaming local media files through Chromecast. Again, I also want to let you know that this book is a collection of the contents you can find in this website. In other words, the methods discussed in the book were all covered in the Chromecast how-to guides in this website. The main purpose of the book is to provide you the offline access of the contents easily. Some Chromecast owners may feel more comfortable to read all relevant topics in one book (instead of different pages/posts on the website). 1.3 what should you know now? 2.2 How to stream local video to Chromecast with Chrome browser (and watch them on TV)? 2.3 You can even stream local video to Chromecast in background in full screen! 2.4 What should you know now? 3.6 What should you know now? 4.1 How to find an Android app to stream local media files to Chromecast? 4.3 How to use playlist in LocalCast? 4.4 What are the pros and cons of using an Android app to stream local media files to Chromecast? 4.5 Will Android screen mirroring replace such Android apps for local media streaming to Chromecast? 4.6 What should you know now? 5.1 Why do we need one more solution (robust and free) of streaming local media to Chromecast? 5.2 Why streaming local media to Chromecast is not as easy as internet media streaming? 5.3 Why Plex media server? 5.4 What can be done? What are the requirements with Plex media server solution to stream local media to Chromecast? 5.8 What should you know now? 6.1 What is desktop sharing through Chromecast? 6.2 When will you need desktop sharing to Chromecast? 6.3 How to setup desktop sharing to Chromecast? 6.4 What should you know now? 7.1 What is Android screen mirroring with Chromecast? 7.2 Why screen mirroring with Chromecast is an exciting feature? 7.3 What Android devices are supported now? 7.4 How to use screen mirroring with Chromecast? 7.5 Will screen mirroring with Chromecast replace Miracast (wireless display)? 7.7 What should you know now? 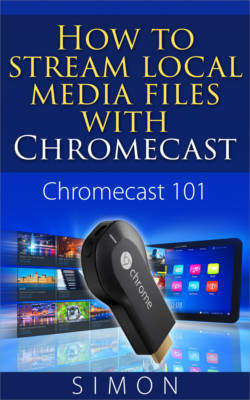 This Kindle eBook (Chromecast 101: How to Stream Local Media Files with Chromecast) is free on Amazon on the following dates: December 2-3 (2 days). Please leave your feedback on these Chromecast 101 guides in the comment box below. Is it possible to setup Chromecast with Windows Phone 8.1? Yes, there are no issues for the setup program with Win 8.1. I’m using my phone for the chromecast but the screen is really little on the tv how can I change that? Can you have 4 chromecasts connected to one source? Each Chromecast works independently. It does not matter how many devices connecting to a source. But some service providers may have some limitations for connections from the same IP address, especially for subscription based services.